← Stop Being So Happy! 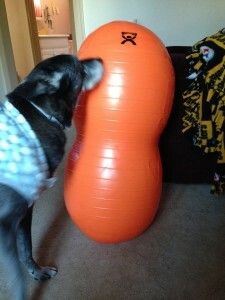 This peanut therapy ball is part of Risa’s ongoing rehab. She’s still doing really well. Last night was our first official training session since I called it quits mid-January. I carried her into the basement training space (she can’t do long sets of stairs anymore) and she was ELATED to be back down there. I kept things very low-key and easy for her since it’s been so long and she’s still recovering. I could tell she wanted to do more but I didn’t want her to overdo it. She was exhausted afterward. Fortunately, her vet thinks she should still be okay to compete in obedience and rally if she wants to. I have two titles in progress in both sports. She has one leg towards her Preferred Novice in AKC obedience and one leg towards her Novice title in ASCA rally. My goal at this point is to finish those titles this year and retire her. We’re starting a class in nosework later this month and I think she’s really going to enjoy that. It’s a great sport for dogs who are reactive, injured, or aging. Risa fits all three! She also loves to use her nose so I think this will be a good fit for her. I’m unsure if we’ll ever attempt to compete in a trial in nosework (or in barn hunt which she has also enjoyed). I just want to keep her mind and body active as she ages since she’s always enjoyed participating in various activities with me. Depending on how she does in regards to recovery and other factors, this may very well be her last year in competition. I knew it was coming but I hadn’t expected it just yet. However, with her serious back injury, it has to come soon. It’s been an incredible ride trialing with this dog. A dog who, for all intents and purposes, shouldn’t have been as successful as she was. We’ve struggled with her fears, dog reactivity, focus, and just training things! I have learned so much and we’ve both come so far. We’re not ready for it to end but the end is definitely near. It’s sad, for sure. But we have so much to be proud of and happy for. I’ll try and keep that in mind moreso than sadness that comes with knowing we’re nearing the end of what has been a fun and challenging journey. This entry was posted in AKC, ASCA, Back Problems, Barn Hunt, Canine Freestyle, Dog Sports, IVDD, Laser Treatment, Lure Coursing, Nosework, Obedience, Physical Therapy, Rally, Rally Free, Reactivity, Training, Veterinarian. Bookmark the permalink.